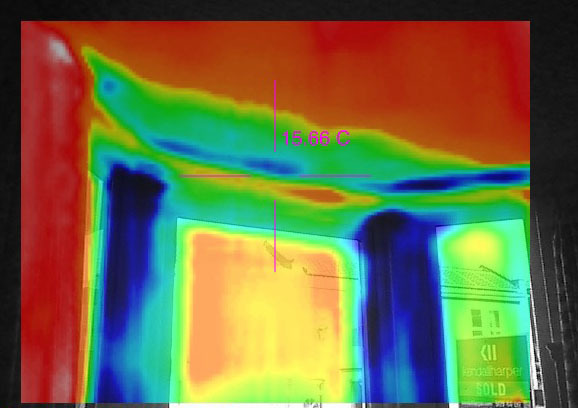 Our internal thermal-imaging surveys aim to improve the comfort and energy efficiency of your home, to you save money on your bills and to reduce your climate impact. The survey process is based on a unique methodology developed by Brian Harper, who has been working with thermal imaging for 45 years and has surveyed over 400 homes. We perform surveys in the winter so that when a house is heated there is a large difference between the temperature inside the house compared to the outside. During the survey, a large extractor fan is fitted to an external door and run continuously to reduce the pressure inside the house. This causes cold air to be drawn in though any gaps. As we work through each room in the house we use the thermal imaging camera to look for cold spots. These may be caused by gaps to the outside through which draughts are pulled by the fan, or by poor thermal insulation from cold bridging or missing insulation etc. As the householder, you are involved directly with the survey by accompanying the surveyor to see first hand how heat moves around your home and where it is lost. The entire survey is recorded as a video with audio of the surveyor's commentary and any discussions you might have with them. The video is given to you afterwards on a USB memory stick, so you can review the findings at any point. Following the survey, a briefing is carried out on the main problems that were identified and how they might be remedied. We will record your current energy use by looking at your gas and electricity bills (you will need to find them in advance and you will have the opportunity to borrow a CHEESE energy monitoring and action pack containing simple-to-use meters to monitor energy use and information on DIY energy-saving techniques. Because we are continuously developing the CHEESE Project and its approach, we will ask you to complete a short questionnaire after the survey to obtain feedback and to learn how effective the survey was for you. We will follow up again after a month and after a year to see if your energy use has changed! Below are our prices for various sizes of home. Please note that main rooms means any large room: including living rooms, dining rooms, kitchen-dining rooms, bedrooms and conservatories, but not bathrooms, separate kitchens, utility spaces or garages. Two living rooms which have been 'knocked-through' into one room will be charged as two rooms. We do offer free surveys to households on low incomes. We assess eligibility for free surveys on a case-by-case basis. It will be useful for us to know whether you are receiving benefits and whether you meet the Minimum Income Standard, which you can find out using an online calculator. * We generally only survey large houses at weekends, though there may be some limited availability for surveying large houses on other days. A note on our pricing: The CHEESE project is a not-for-profit volunteer-run organisation, which allows us to provide surveys at very low cost. Our highest charge is less than half the true cost of delivering the survey if we were to factor in the true cost of staff time and other overheads. For free surveys, we additionally rely on grant funding to make up the difference. The overwhelming response that we get is that our surveys are fascinating and exceptionally good value. Apply for a survey now!